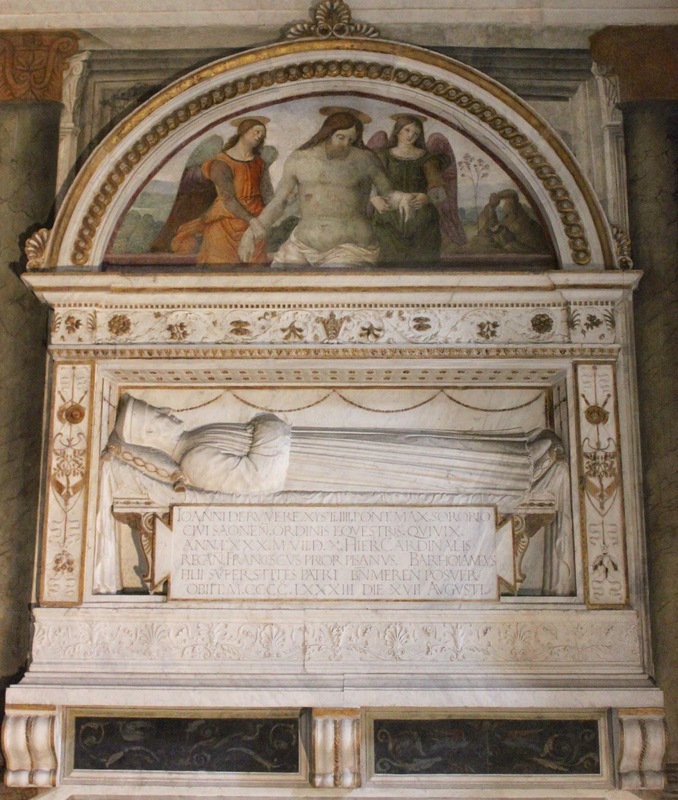 The Roman Anglican: The Pintoricchio chapels in Santa Maria del Popolo. The Pintoricchio chapels in Santa Maria del Popolo. The wonderful Renaissance church of Santa Maria del Popolo hosts some marvellous XV century masterpieces by Bernardino Pintoricchio, a great artist from Umbria who also worked in the Borgia apartments, the Piccolomini Library in Siena and the Bufalini Chapel in Santa Maria in Aracoeli. Here Pintoricchio works mainly in two phases: two chapels that were decorated in the 1480s and the choir’s ceiling which was decorated in the early XVI century. The first chapel on the right hand side is the Della Rovere Chapel - also known as the Cappella del Presepio and it is dedicated to Mary and St. Jerome. 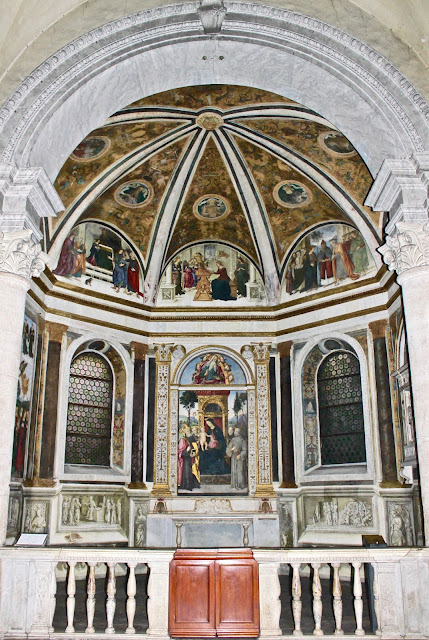 The chapel was commissioned by Cardinal Domenico Della Rovere after Pope Sixtus IV had started the reconstruction of the basilica, from 1471 to 1483. The architecture has a peculiar Lombard feeling and it might be by Andrea Bregno, famous for his monuments. The frescoes are attributed to Pintoricchio and his workshop - the decoration of the chapel was executed between 1488 and 1490 - coinciding with his ceiling decoration in the Della Rovere’s palace near the Vatican. The chapel is hexagonal with a ribbed vault divided into six segments. The architectural space is enclosed within a painted mock architecture decorated with grotesques - with a monochrome base. 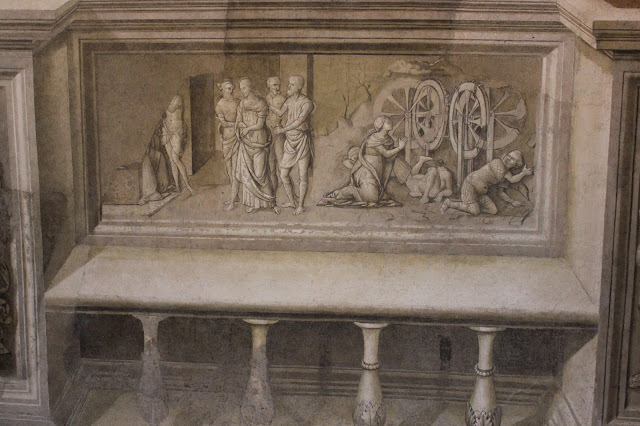 Pintoricchio’s fresco representing the Adoration of the Child is located above the altar - the other two walls host windows and the tombs of the cardinals Giovanni de Castro (died 1506) and Cristoforo Della Rovere (died 1478) and Domenico Della Rovere (died in 1501) - this scene is enclosed within a decoration of grotesques. The grotesque polychrome on yellow-gold are high quality and have been enhanced by a recent cleaning - its rich repertoire of figures includes gargoyles, swans, camels, shells, musical instruments, etc., It is inspired by the art of the Roman Imperial Age. They are therefore attributed to the hand of the master who would have been the only one to put into practice a bold experiment, among the most successful of its kind. 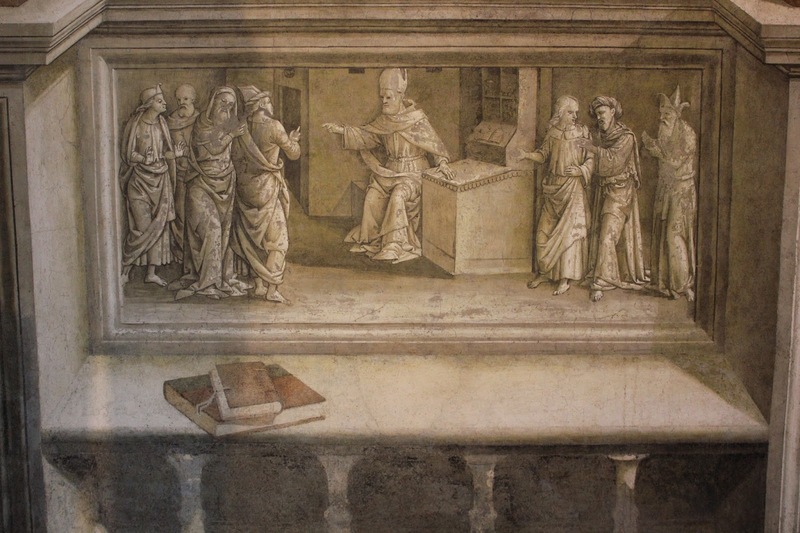 -St. Jerome disputes the virginity of Mary with the heretic Elvidio. -St. Jerome penitent in the desert. -St. Jerome removes the thorn from the lion. -St. Jerome in his study with St. Augustine. The lunettes are quite damaged and it is only possible to appreciate the composition in general, who according to Strinati is influenced by painters who were then active in Rome - such as Piermatteo of Amelia and Antoniazzo Romano. Some deny the authenticity of the lunettes, referring them to Tiberio d'Assisi. The works had much golden decoration, as evidenced by the spheres of red wax on the edges of the garments that served as support for the leaf of gold. The Adoration of the Child with St. Jerome is located above the altar as a fake altarpiece, framed by an arch made of marble and gold. This work has always been considered an authentic work of Pintoricchio, whose finesse came out during the restoration. 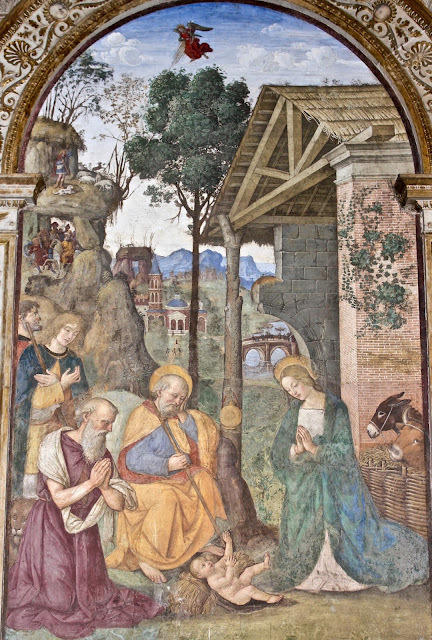 In front of the Nativity’s hut, partially in ruins and with walls of different materials (symbolizing the pagan and Jewish religions that witnessed the rise of Christianity) and with the roof trusses viewed from blow - there is the Holy Family, St. Jerome and the shepherds in adoration of the Child, laid in the bottom center of a bundle of wheat, in remembrance of the bread of the Eucharist. The ox and the donkey are on the right - closed by a fence of woven twigs, while Joseph is represented in the typical dormant attitude, recalling his role as mere overseer of Mary and the Child, without active participation. The rich background is lost in the distance thanks to the rules of aerial perspective that makes things appear far more nuanced in the color due to the bluish haze. it is populated by a city on the banks of a lake and a series of rocky outcrops, in which it is set also the arrival of the procession of the Magi and the announcement by the angel to the shepherds, located at the top center. 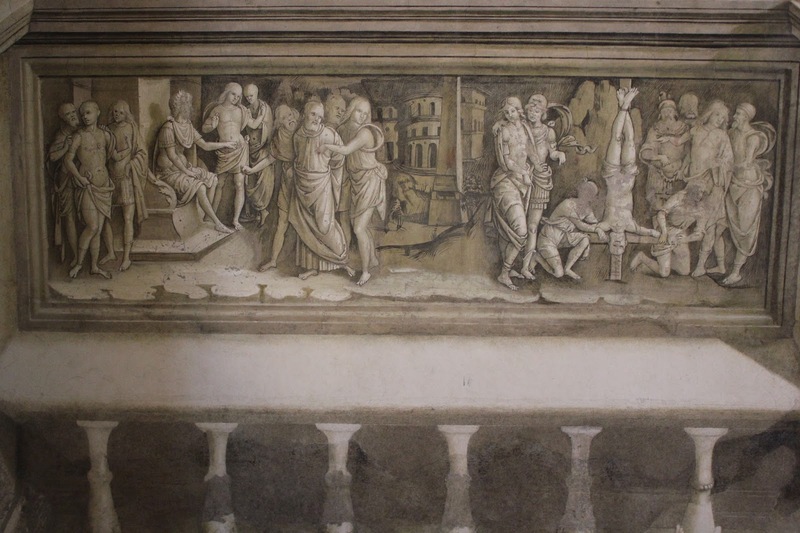 There is a tree in the center that dives the two parts of the fresco giving it a sense of balance. 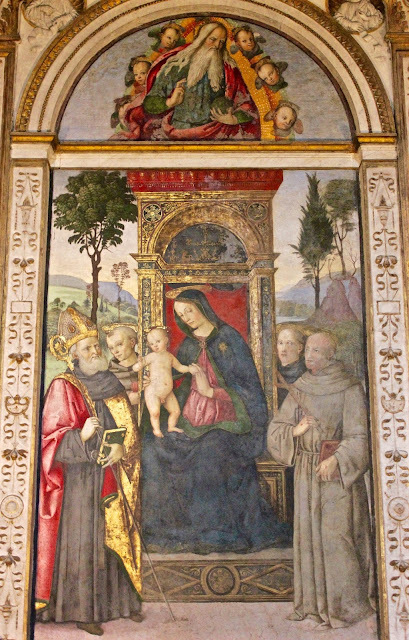 The most refined parts of the fresco are the Virgin and Child - their vivacity of looks and gestures recall works by Antoniazzo Romano, the great Roman Renaissance artist. This is the third chapel on the right hand side and it is dedicated to St. Augustine - this is the other chapel to host works by Pintoricchio and his workshop. 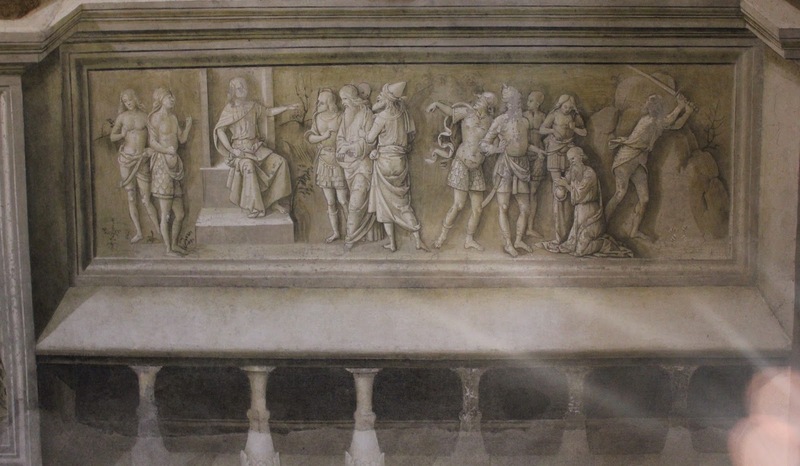 The chapel was commissioned by Bishop Girolamo Basso della Rovere after Sixtus IV had started the complete reconstruction of the basilica, from 1471 to 1484. Also in this case the architecture has a Lombard feel and is probably by Andrea Bregno. 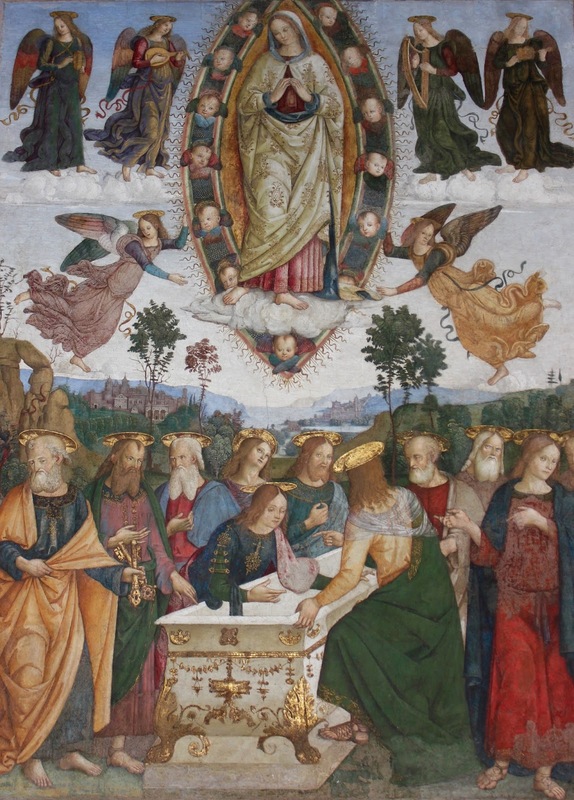 The paintings are attributed to Pinturicchio and his workshop, who worked in an unspecified period circumscribed between 1484, when the chapel was refurbished, and 1492, when his patron was at the episcopal seat of Palestrina. 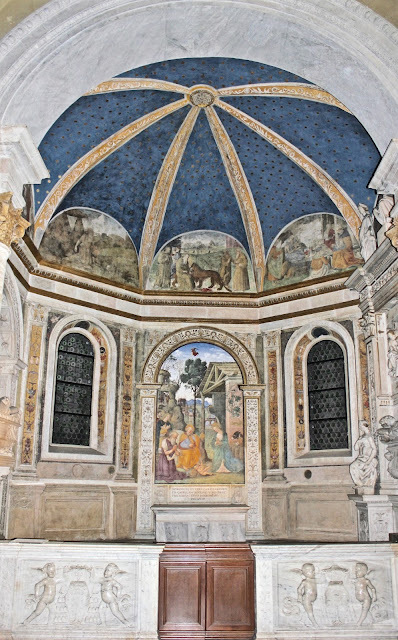 Compared to the nearby Cappella del Presepio, which is also by Pinturicchio, the Basso Della Rovere Chapel presents a greater decorative scheme. A mock portico is indeed set on the walls of the hexagonal chapel which is covered by a ribbed vault made of six segments. Fake porphyry columns with Corinthian capitals hold a golden entablature of white marble and gold and placed on a base decorated with (fake) benches and illusionistic monochrome reliefs. Two books painted in perfect perspective rest on one of the painted seat, deceiving the viewer. The bottom has significant similarities with inlays of the Studiolo of Guidobaldo da Montefeltro in Gubbio and today in the Metropolitan Museum of Art in New York. 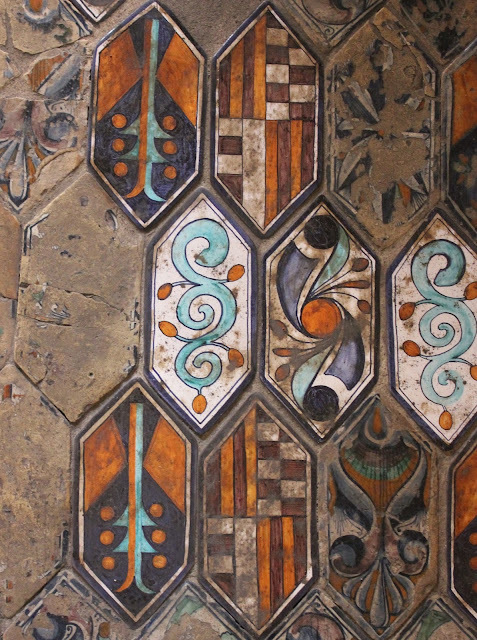 The profusion of polychrome decorations has its apex in the tiles of the floor, contemporary works from Deruta, reporting heraldic Della Rovere trees, animals and other motifs. In the five lunettes there are stories of the Virgin. Above the altar is the large fresco of the Madonna and Child Enthroned with Saints Augustine, Francis, Anthony of Padua and a monk - the lunette shows the Eternal Father giving a blessing. Everything is enclosed by a marble cornice with rich golden decorations. On the two adjacent walls there are two arched windows with grotesques, and the fresco of the Assumption of our Lady and the tomb of Giovanni Basso della Rovere, surmounted by a lunette with the a fresco of a dead Christ supported by two angels. What a wonderful, and almost unknown, treasure! The Bufalini Chapel in the Aracoeli. Florentine links - Church of Ognissanti. The Capponi Chapel in Santa Felicita, Florence. Please join us in this cause!